Click on image for 100 new pictures of Chernobyl. There are all sorts of people ranting about Elena’s fabled motorcycle tour of Chernobyl. Actually, it was an elaborate flight of fancy, but if extreme tourism is your strong point, you can dispel the rumors and see the region for yourself. Sounds like fun, doesn’t it? Just you, a driver and a guide, touring Pripyat and the radioactive ruins for the reasonable sum of $193 per day. You can take the same tour that Elena took when she published her fanciful account of visiting Chernobyl on a motorcycle. By the way, if you hadn’t heard that her account was "highly imaginative", you can pick up the latest twist on the story on this thread. Instead of ranting like those who were upset by Elena’s elaborate deception, you can follow in the tracks of Tony Brown, who has taken the Chernobyl tour with guide Rimma Kiselitsa and has written a brief account here. Tony states, "By the way, it’s not exactly a tour group – it was myself, my driver (in the fearsome Soviet Lada car) and Rimma. That’s it. It’s a private tour, not exactly a Greyhound tour of Chernobyl.."
Details of the tour that he took can be found at the SAM Travel site. You can book your own tours if you’re interested. SAM Travel advertises, Chernobyl tour – visit the site of the worst environmental disaster in history. 8:00; Depart Kyiv. Two-hour ride northwards to the border of the "exclusion zone". The area is 214 km in perimeter. deserted apartment blocks, schools, hotels, kinder gardens. 13:00 – 13:30;Lunch (the quality of food is guaranteed). Really?? 13:30 – 14:00; A briefing conducted by a specialist of the governmental agency "Chernobylinterinform". Get answers to your questions about the accident, current ecological situation and the future of the exclusion zone. You can take the same pictures Elena did and tell your own version of the visit. the truth. Interest in Chernobyl continues unabated to this day. Be the first to post a definitive and accurate picture tour of Chernobyl and you may attract more visitors than Elena did. Truth drives out falsehoods and that is the real power of weblogs. Tony is still trying to set up his web site, but he has posted this incredible panoramic photo. When you scan the entire image, it gives you the sense of being there. 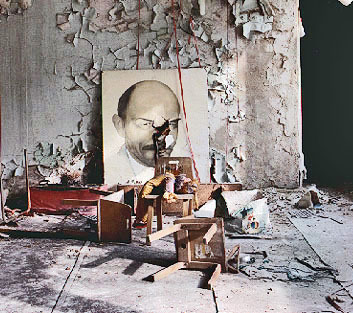 access to 100 new photos of Chernobyl taken over a five year period. This entry was posted in Chernobyl. Bookmark the permalink. On my StatCounter search term list, I actually saw a search string regardin’ our favorite young Chernobyl visitin’ motorcycle ridin’ photographer with “snopes” within the string. I guess someone thought her exploits were an urban legend. I enjoy seein’ all those photos she shares with the world on her site. She is definitely an amazin’ young lady. Hi — if you don’t want to visit Chernobyl and write your own story, you can see “Chernobyl Heart” on HBO on Demand through March 13, 2005. I was there while it was being filmed — my photos are on http://www.chernobyl-international.org, as well as other real, authentic photos of children in Belarus, the country that received 70% of the fallout. I will be heading back there in April, and will post more photos on the web site after that. I think we should not be too quick in discrediting her. Does anyone know if it is still possible to find a fixer to take someone to Prypyat? In order to further the efforts to allow as many to venture to Chernobyl as possible, xteamartists inc. just finished production of a short film documenting about twenty college students through a government tour of the Chernobyl Nuclear Power Plant and its surrounding areas.